Are you getting this error after buying a new iPhone? If you are like me, you use a different voicemail service than the standard voicemail that your wireless carrier provides. For example, I use Google Voice voicemail (which, by the way, I mention extensively in my book, The Cheapskate’s Guide to Traveling with Your iPhone) because it can transcribe my voicemails into text messages and it lets me check my voice messages on a computer. When purchasing a new phone, one must reset the alternate voicemail setting or else messages begin to be delivered to the standard voicemail again. Usually, this isn’t a big deal to do. It simply requires dialing a particular code on your phone, hitting send, and presto! However, when I recently purchased a new iPhone 6, it was not that easy. For some reason, the Conditional Call Forwarding (CCF) code I normally used returned error messages. Being the first day of the new iPhone 6, I thought that perhaps AT&T’s system was overloaded. I tried a few times that day and still no luck. Being a Friday, I tried a few times again on Saturday and Sunday and thought for sure it would work. No luck at any of those times. Assuming it was a problem with my account, on Monday I went into my local AT&T store and figured they could “fix the glitch". However, the knowledgable person I talked to said he was having the exact same problem with his new iPhone 6 as well. He said he believed it was a problem with iOS 8 and there was nothing he could do at the store to fix it. So off I went to do a little research on the Internet. 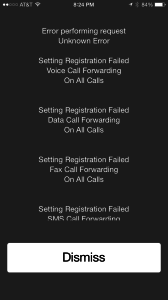 The first thing I found was an App, Divert Calls, that claimed it could set up Conditional Call Forwarding. I wondered if it could work around the problem I was having, so I downloaded the App and tested it. As it turns out, the App itself doesn’t actually change the CCF setting. It merely creates the code for you so you can paste it into the Phone App dialer and send it. Once I found that out, I thought I was dead in the water. However, Conditional Call Forwarding is actually three different settings. The code I had been using (which starts with **004*) changes all three settings at once. The Divert Calls App gives you three individual codes for CCF (*61*, *62*, and *67*) . So I went ahead and tested the first code. I was pleasantly surprised that it worked! So I went ahead and tried the other two codes and they worked as well! It was a little bit of a pain, but at least my Google Voice voicemail was operational again. The iPhone 6 and/or other iPhones running iOS 8 have a problem setting up Conditional Call Forwarding (CCF) on AT&T’s network using the usual **004* CCF code. I am not sure if this problem exists on other wireless networks, such as Verizon, Sprint, or T-Mobile. The problem can be worked around by setting up each individual call forwarding option (Unanswered, Unreachable, Busy), or calling AT&T and having them do it for you. The codes can be generated by the Divert Calls App, but it is not necessary if you know how to generate the codes yourself. If you have any further information on this issue or are experiencing it on other wireless networks, please comment below!